I have never really liked wild rice, but found this recipe that instructs you to cook it until it "pops" open. I actually cook it a little longer, and have found this is delicious. Look for organic or non-gmo rice for the best flavor. 1. Bring 5 cups water to a boil. (do not salt water) Stir in rice, then reduce heat so liquid is just simmering. Cover and cook until grains just begin to pop, about 40 minutes (see note below). Drain excess liquid from rice and set aside. 2. Meanwhile, melt 4 tablespoons butter in a large skillet over medium-high heat. Add half the mushrooms and cook, stirring occasionally, until they have released their liquid and are golden brown, about 8 minutes; remove to a plate. Repeat with remaining butter and mushrooms. 3. Return all the mushrooms to the skillet and season with the salt and pepper, to taste. Very carefully add sherry to deglaze the pan, and cook until most of the liquid has evaporated but mushrooms are still moist. 4. Mix mushrooms into prepared rice and season again with salt and pepper. I prefer to use chicken broth over sherry and cook it a little longer, about 10 minutes, so the grains open more fully. * Never, for this or any other wild rice recipe, mix wild and white rice. 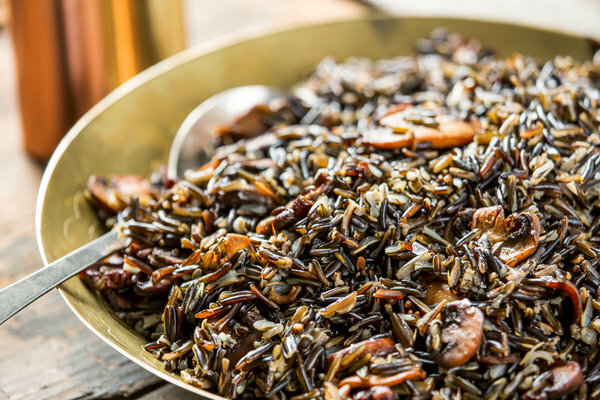 The white rice dilutes the flavor of the wild rice and is done in less than 20 minutes, while the wild rice takes 2-3 times as long, destroying the texture of the white rice.